The purpose of this post is not aimed at promoting the use of nail polish as a muslimah, whether it's during your time of the month or just generally using a breathable coat on your nails throughout the month. I believe this is a personal choice, and depends on your own individual views - none of which I intend to engage here. When I posted the image last week of the colour on my nails, it sparked some debate around the issue of Halaal nail polish, I respect all views, however I do not wish to continue it here. My intention: to test the claims, and share the results with anyone else who may be unsure. As a parent myself, I would like to be kept abreast of what is out there and what our kids are exposed to, on all fronts. Furthermore, this review is not solely for Muslim readers as breathable nail polish is actually healthier for the nail. Orly is not only breathable, it also conditions the nails, leaving the nails in a better condition after a week than most other brands. I can attest to this, I had been buffing my nails so much to add some shine to the henna, it was in need of some conditioning! This product also features advanced oxygen technology that allows oxygen and hydration to penetrate the nail, allowing it to stay moisturised. I was invited to try out the Orly Nail polish by the company, and after visiting the distributor head office for a trial manicure, I had sight of the Halaal certificate issued by ICSA. So my interest was piqued and I wanted to test the water permeability for myself. Having tested other breathable polishes, I wasn't entirely convinced. 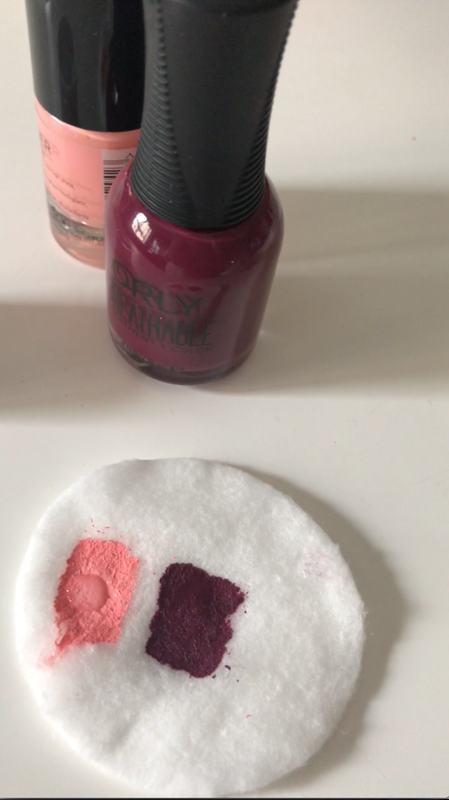 In order to test whether water permeates the polish, I painted some on a cotton wool pad, allowed it to thoroughly dry, and dropped water on it. (PS:I tested it on one coat only). The water droplets immediately seeped through the Orly nail polish whilst it stayed on the surface of the regular polish. This confirms the water permeability test. A comprehensive list of stockists and colours can be found on the Orly website. is still on the surface of the regular polish. Overall, aside from the light consistency and conditioning formula, the manicure remained intact for the entire week. After a week there no chips or peeling and even though the formulation is very light, the colour is still deeply pigmented.